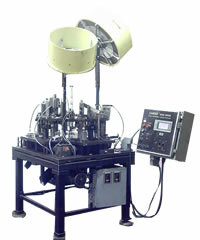 The Camdex 2500 Series Rotary Index Loading machine is the workhorse for the factory setting. Its design allows it to be adapted to the loading task at hand. The machine is configured for double powder checks, overall bullet length, crimping, chambering, and headspace checks to assure quality ammunition in most rifle calibers.The 2500 Series can be built in most rifle calibers up to and including .50 Caliber. The machine is equipped with large over-sized feeders to make it easy to assure a ready supply of cases and bullets. The powder hopper is also large enough to accommodate sufficient powder for the larger rifle calibers. This rotary index machine allows the operator to monitor all of the mechanical functions of the machine and correct any faults that may occur. The 2500 Series Rifle Loader is controlled by a Programable Logic Controller and a Touch Sensitive Screen for easy operation and precise location of any fault sensed by the external fault switches. The machine can be equipped with large over-sized feeders that make it easy to assure a ready supply of cases and bullets. The powder hopper is limited to four pounds of powder to be replenished in the sequence of loading.